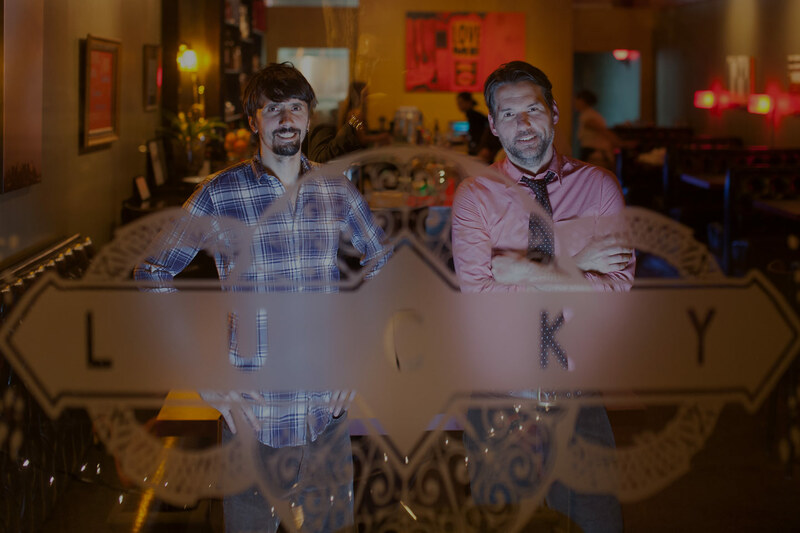 Band mates, friends, and co-owners Hunter Johnson and J.P. Powell have been operating Lucky since November of 2010. Drawing their inspiration from establishments they visited while on the road playing in their band MY RADIO. Over the last 7 years, with the assistance of Chef TJ Daveldek, the duo has worked to bring the region a dining experience more attuned to Lower Eastside Manhattan, than Southwest Virginia. At Lucky, you will find dim amber lighting, and a ban on all things TV. Fresh Rappahannock Oyster Co. Oysters, Marrow bone, and Fried Chicken, fine wine, craft beer, hand crafted cocktails, rounded out with a wide selection of whiskey and spirits. Lucky embodies high-end comfort food and craft cocktails into a truly unique dining experience.